Here's some quick tips, tricks, and battle strategy guide for the action RPG mobile game Sword Art Online: Memory Defrag, now available to download from the App Store and Google Play! - You can adjust the camera's zoom by going to Menu > Settings > Battle Settings. - You can toggle the battle controller position to suit your favored hand from Menu > Settings > Battle Settings. - Go to Menu > Settings > Battle Settings and switch movement assistance to "ON" to approach enemies automatically. - This will also help ranged weapon wielders to target enemies much easier. - If movement assistance is "ON", your character will automatically target and attack the closest enemy. Tap a different enemy to target them instead. - With ranged weapons, "Tap+Hold" to charge up for a powerful focused attack. - Landing consecutive blows to an enemy increases your Combo count. - Combos will break if you didn't land an attack within a certain amount of time. If you get hit, or if you switch between characters (this can be remedied with combo window Skill Slot), that character's combo count will also end. - Note: Damage dealt increases by 5% for every 10 Combo Hits. - All three of you will share one Combo Hits count, so if one gets hit, the Combo will end. - When faced with a guarding enemy, try to attack from the rear! How To Knock Down Enemies? - Flick up to jump, then flick down to perform a head splitter! - Note: The stronger the enemy, the less likely they will be taken down. - Some characters can do massive attacks (usually their Sword Skill 3) that can knock down the enemy (aka "Take Down"), or at least disrupt their movement for a period of time (aka "Lock Down"). 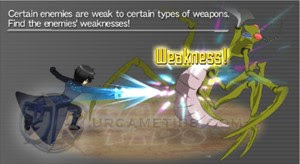 - Focused critical attacks can also knock down lesser enemies. When an Enemy Glows Red! - Enemies that glow red cannot be staggered or knocked down. They still receive damage as normal, but they can counter-attack, so be careful. - Attack cancel is used to cancel the normal attacks of your characters, allowing them to quickly switch from offensive to a defensive stance. 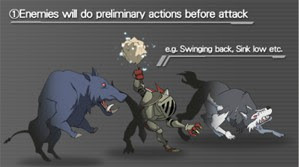 - Example #1: While doing normal attacks, quickly use "Block" to cancel (best right before they perform their first attack animation), then proceed to parry or dodge. Repeat as needed to sink in hits and regain some extra MP while avoiding damages. - Example #2: While attacking, simply swipe to any direction to cancel. - With the new update, range units can now parry parriable attacks! Use the Practice Mode under "Others" menu to learn how to parry well. 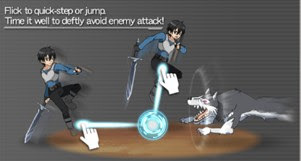 - Alternatively, you can simply swipe to any direction to cancel your normal attacks and dodge incoming attacks. - If you are carrying a close-range weapon or weapons, "Tap+Hold" to guard. - Guarding reduces damage received from enemy attacks. - Continuously guarding an enemy's attack will lower your guard gauge, eventually resulting in a guard break, which will stun your character. - While guarding (melee) or charging attacks (ranged), flick up in time with the enemy's attack to parry it. - "When the enemy's eyes glow red, that's your chance!" Well, not always though because sometimes you won't have time to check their eyes, observe their attack patterns as well, then learn when to parry. 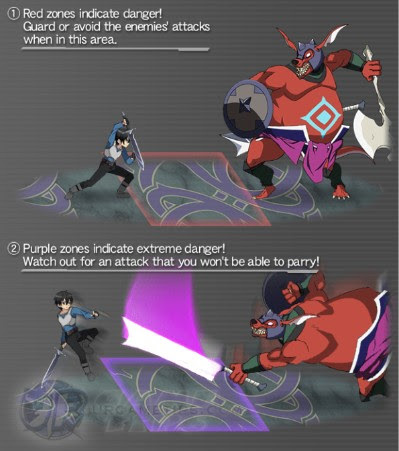 - Note: Most physical attacks can be parried, but check the color of their attack zones. 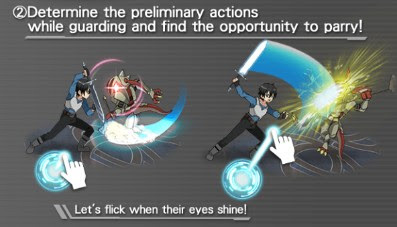 - Switching characters the moment the parry succeeds will cause a sword skill to be unleashed, dealing major critical damage. How To Dodge Enemy Attacks? - This is ok if the enemies are shorter than you and if their attacks are way low. - Jumping horizontally is way better, but it's a little tricky to execute. (flick upwards but a bit leaning to the right or left). - Flick sideways to perform a quick-step and dodge enemy attacks. - This is effective against melee enemies, but not that great against ranged or AoE attackers. - Now this is what I highly recommend, flick downwards to do a quickstep below the enemy's line of sight. This is also an effective maneuver against most ranged or AoE attackers, just time it well (take note of their telltale motion before attacking). - Highly recommended, especially for ranged characters. Flick diagonally downwards or upwards to avoid enemy attacks, this will give you a better position to cast your spells or skills. - If your character and your enemies are at the bottom area, just move up to let them follow you (not all the way up though, so that you can quickly dodge AoE attacks). - You can also use these techniques to quickly attack from the rear of your target. How To Avoid Getting Knocked Down? - Aside from Blocking, Parrying, and Dodging, you can also avoid getting knocked down from enemy attacks (including lesser enemies) by "Switching Characters". - Once you are about to get hit by an attack, quickly switch to perform a Sword Skill against it. This will make your character immune from knock down attacks, but will still get some damage. - Simply using a Sword Skill right away will also work, but not always. - Each weapon has 1 of 4 different characteristics, each having their own strengths and weaknesses. - You may also use this as a guide while creating parties. Example: 1 Slasher, 1 Striker, and 1 Piercer, then switch as needed. - Swords and Dual Blades. - Also Not effective against Elementals. - Single-Handed Clubs/Mace and Guns. - Guns (SS1): Usually have a high number of hits, useful for generating combos for Multiplayer Modes. - Rapiers, Lances, Daggers, and Bows. - Rapiers/Lances (SS1): Usually thrusts a long forward attack, useful for escaping, moving behind enemy, and for clearing mobs. - Daggers (SS1): Quick 2 hits from front then back, useful for hitting enemies that are weak when attacked from their back. - Bows (Normal Attacks): useful for hitting flying enemies. - Rods (Normal Attacks): useful for hitting flying enemies. - Lance wielders can also do parries by simply dashing forward (aka Step Parry). - Can also be used when sliding diagonally upward or downward. - Switching to a Lancer that doesn't have enough MP to use any skills, will also execute a Step Parry. This is very useful for ranged units that can't parry at all, just time it well. - Default attack's speed and hits increased. - Attack and Movement Speed increases per 10 combos, until 50x combo. - SS3 animation duration also decreases around 5% per 10 combos. So their DPS potential is at MAX when you have 50+ Combos. However, we will only consider their average DPS and Speed for comparison. - Just Guard: You can parry as you guard against parriable attacks at the right timing! If you guard against non-parriable attacks at the right timing, you won't get any damage. 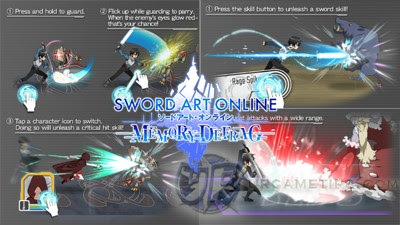 - Shieldblade characters becomes "defense mode" with their shield during the motion. - Note: There are times that the characters can't hold their shields. When the characters are in the defense mode during the motion, Just Guard doesn't happen. You are able to do regular parry as well. - A mace character will be in this state "Protect Body" where they can reduce their damage and doesn't bend backward easily for 3 seconds after they keep guarding themselves for a certain period of time. - During the state “Protect Body”, normal attacks don’t cut in a combo! - Please note that even when “Protect Body” is activated, still, due to some special attacks or unusual status, a character could bend backward and a combo could be cut off.